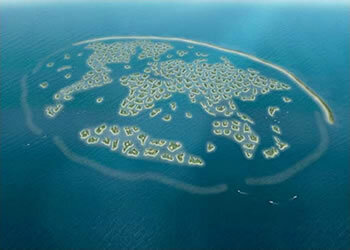 Al Nakheel Properties are working on a Dubai island project that will consist of between 250 and 300 islands shaped like the continents of the world - The Dubai World Islands. The islands will have private homes, estate homes, resorts and community islands. Each will range from 250,000 to 900,000 square feet in size, separated from the others by fifty to one hundred yards of water between islands. The entire development will be about 9 kilometers by 6. It is located four kilometers off the shore of Jumeirah, United Arab Emirates. Each island is expected to fetch upwards of $US7 million. Larry Niven did something amazingly similar to this in one of his novels. In his award-winning novel Ringworld, Larry Niven creates for us an amazing artifact - a ribbon of matter that entirely surrounds a star. Spin it up for artificial gravity, put some tall edges on it to hold in some atmosphere, and you have an incredible amount of real estate. The Ringworld was created from all of the non-solar matter around its sun, including all of the planets. Since you could create upon the surface of the Ringworld any shape continent or sea, wouldn't you choose shapes that are familiar? "Hold it. I want a closer look at those groups of islands!" "Why, Louis? That we might stop for provisions?" "No... Do you see how they tend to form clusters, with wide stretches of deep water between? Take that grouping there." Louis's forefinger circled images on the screen. "Now look up at that map." "..And that grouping in what you called a bay, and that map behind you. The continents in the conic projections are a little distorted... See it now? Ten worlds, ten clusters of islands. They aren't one-to-one scale; but I'll bet that island is as big as Australia, and the original continent does not look any bigger than Eurasia on the globe." ...The first generation -- they had to throw away their own worlds, but they wanted to keep something of what they were losing. Three generations later it would be funny. It's always that way." Read more at Dubai: The World Islands; thanks to Jack (an alert reader) for the tip on this story.